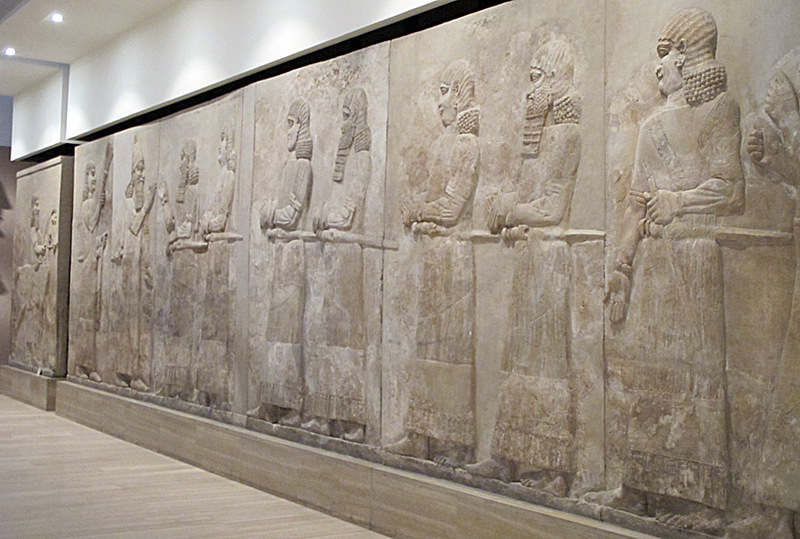 The star exhibit is a stunning collection of Assyrian works from Khorsabad, including two enormous larger-than-life carved scenes of courtiers bringing gifts to the King, two giant guardian Lamassu, a large statue of Nabu the god of Wisdom and Writing, and much more. Lamassu are Assyrian winged bull or lion guardian figures, with Kingly human heads, typically positioned to guard gateways. The gods have wisely provisioned them with five legs, so that they appear stable when viewed from either the front or the side. 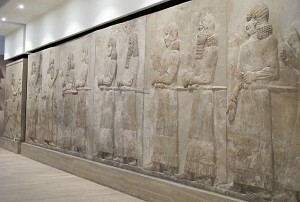 I was greatly struck the first time I saw the ones in the British Museum. 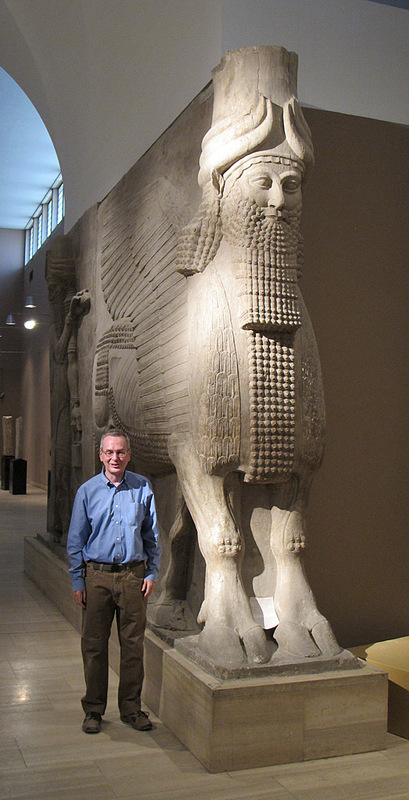 I’ve now seen others in Paris, Chicago, New York and Persepolis, so it was great to finally see some in their home land of Iraq. The Khorsabad hall has both the two giants and a mid-sized pair. 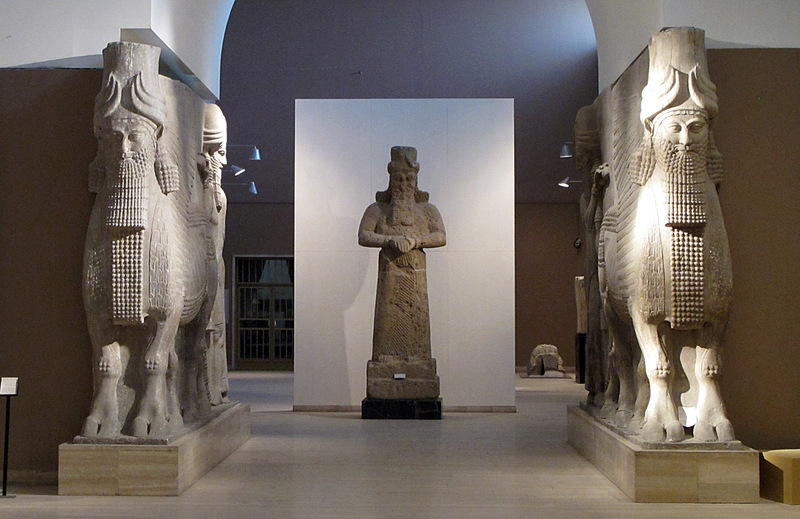 An earlier Assyrian room has a very unusual pair of miniature Lamassu, each only about three feet high. The right-hand one in particular is very well preserved and a delight to see. 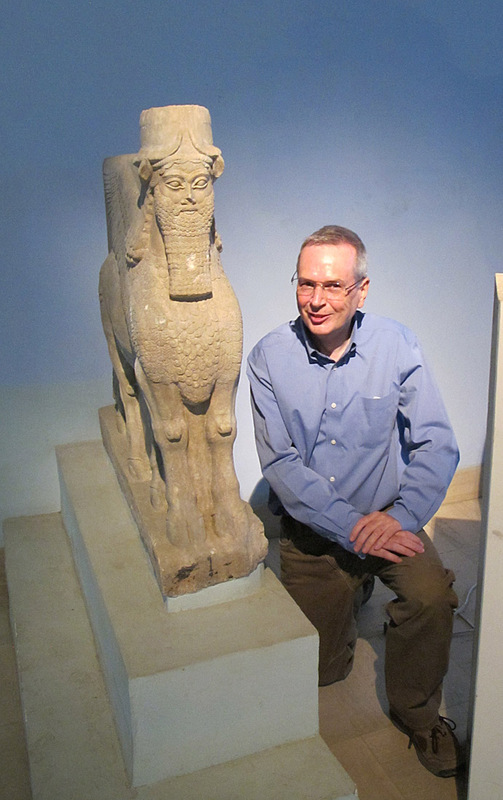 There is much more in the museum: I was led through halls of statues from 1st-3rc c. Hatra; of assorted Islamic coins, artifacts, and decorations, of small scale Assyrian pieces (some of very high quality) and a few older Sumerian pieces. 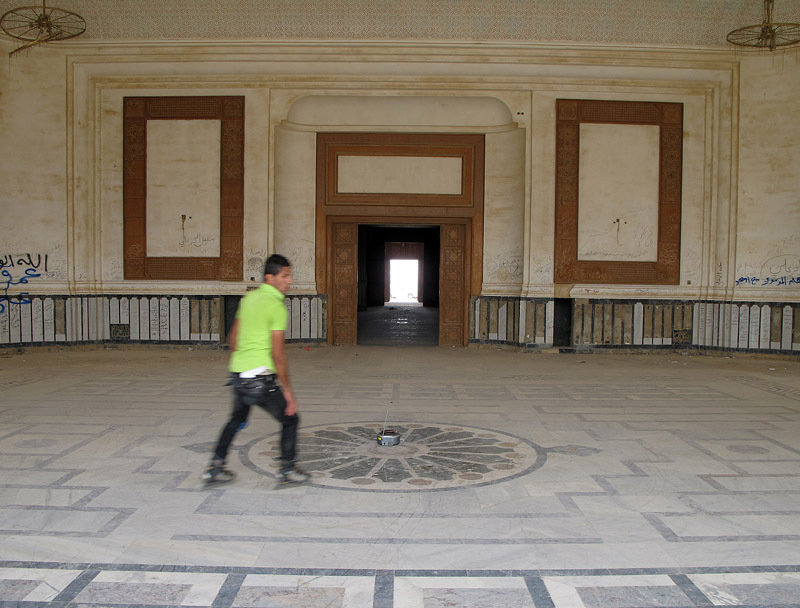 I was allowed to briefly poke my nose into a room still under renovation where Assyrian ivories and other high-value items are being prepared for display. Unfortunately the Museum isn’t yet generally open. My guide (Basim from Babel Tours) takes in small groups fairly regularly and was able to get us admitted. We had the place to ourselves! 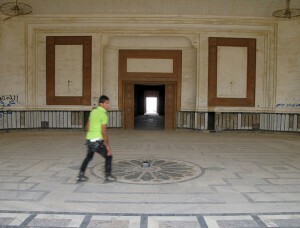 I hope the various renovations complete soon and the Museum becomes fully operational. 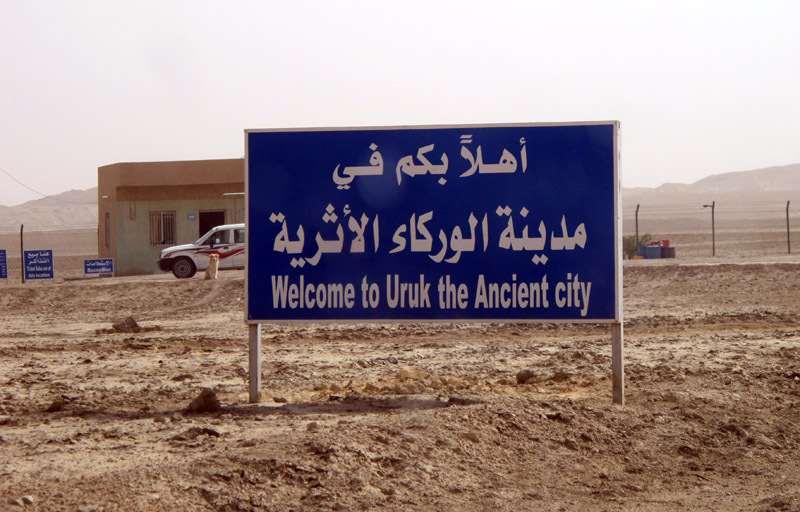 The Uruk site is well organized, with large explanatory signs, a strong perimeter fence, and (wonder of wonders) an actual ticket office, which doubles as a guard post. We were the only visitors of the day so it took a few minutes to round up the ticket seller. Uruk was the first great city, the home of writing (! ), prospering from around 4000 bc onwards. The site was also occupied by many successor civilizations, so there is a wide range of material, from early Sumerian to Seleucid and even Parthian. 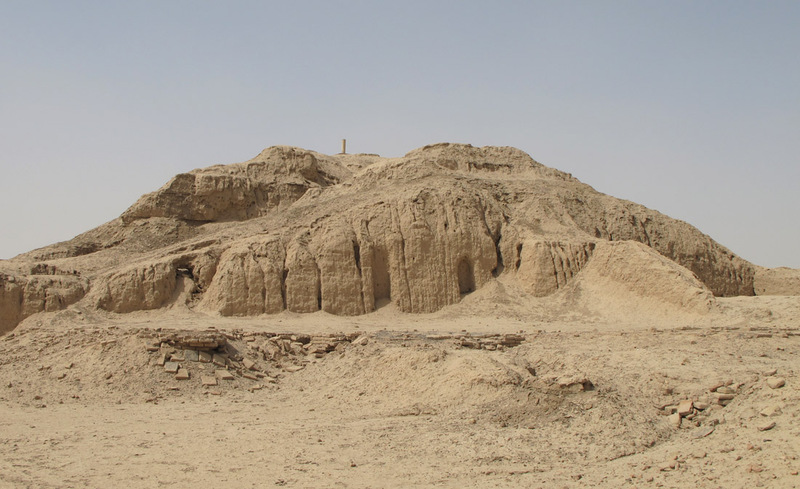 The site covers about 7 sq km, with many acres of scattered shards, occasional lumps of mud brick, and two major temple mounds. 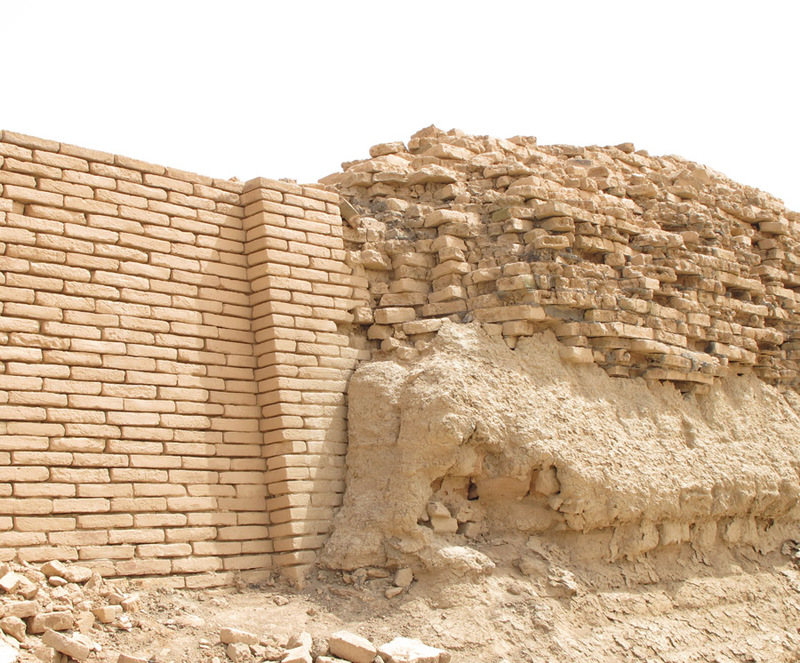 As we walked, our site guide pointed out a mud brick wall from the time of Gilgamesh; many mud bricks with Babylonian cuneiform stamps; a mud brick with a much simpler early Sumerian cuneiform stamp; and much more. 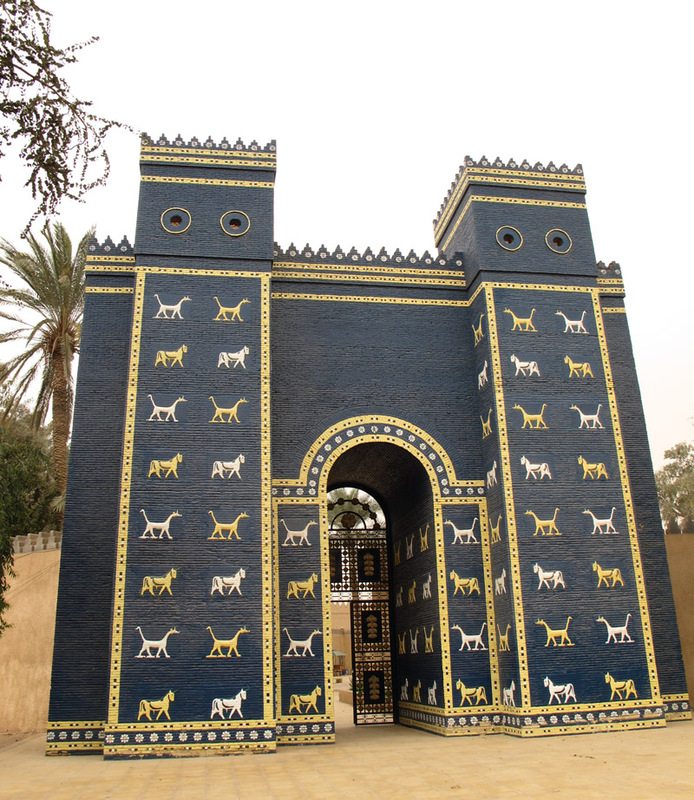 Frequently Sumerian and Babylonian and Seleucid work is all intermingled. 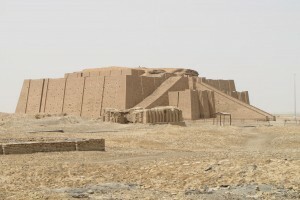 The most prominent mound is the mud brick platform of the Red Temple (around 3100 bc), distinguished by a modern concrete marker pillar on top. Alas, almost nothing visible remains of the temple itself. 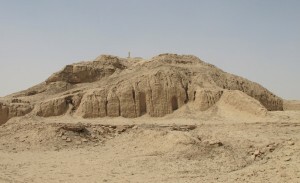 The White Temple aka the Sky God Temple, from 3000 bc is also at the top of a tall mud brick platform. 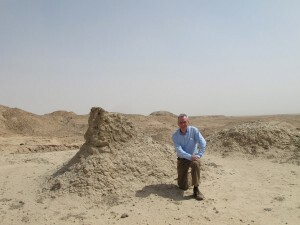 The temple is now only a few low mud brick mounds, perhaps from pillars or a wall. But given its vast age, any remains at all are still damned impressive. I thanked the Sky God for sending me reliable GPS and prayed for better wireless internet. 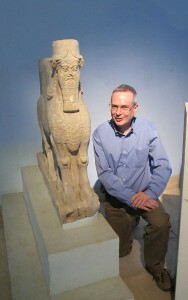 We also visited Agee Gal, a very large Seleucid Temple. 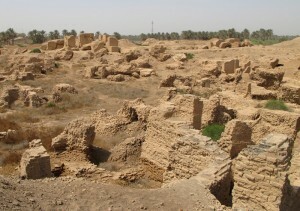 Only the two ends have been excavated – a long central section is still untouched. 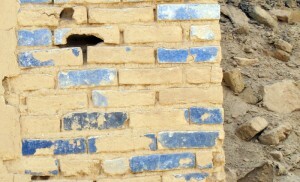 A few of the exposed bricks have the original bright blue glaze akin to the Ishtar gate, but most of the glazed bricks are very faded. 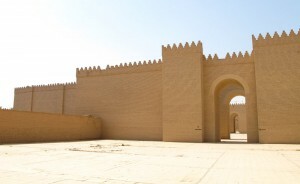 I am in Mesopotamia in placid Southern Iraq (yes this part of Iraq is genuinely safe) on a private tour with Babel Tours. (Tour notes.) If you are seriously interested in ancient history I recommend a visit! There are very few tourists in Iraq at the moment, so I was expecting the ancient city of Ur to be almost deserted. 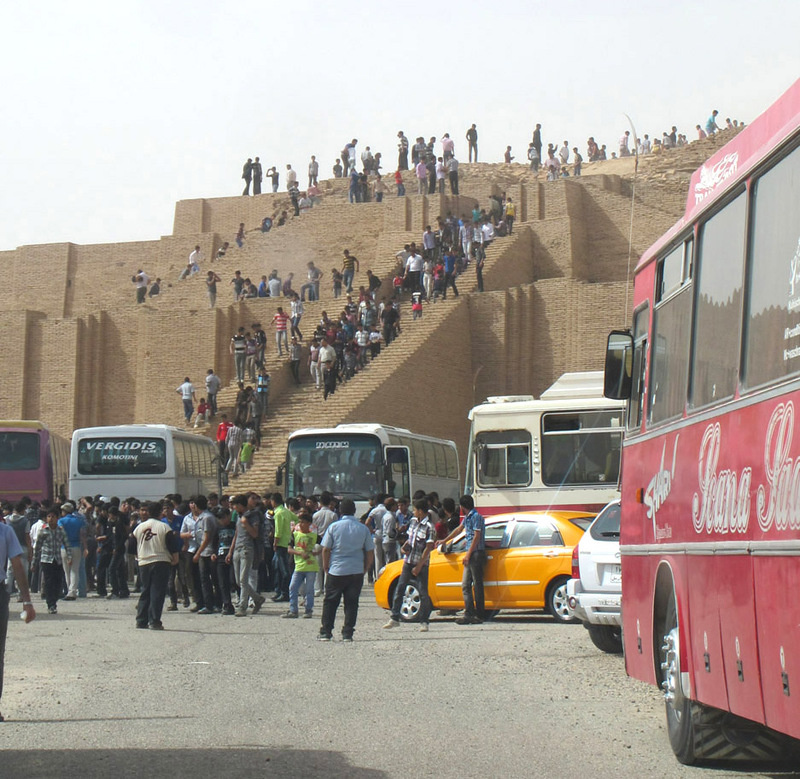 But no, as we approached the great ziggurat, we saw about 40 tour buses parked and hordes of teenagers cavorting around the site. Say what? 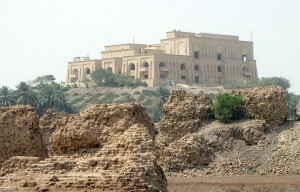 It turns out it’s the last month of the school year, and ancient Ur is a favorite site for local school outings. (This seems like a good thing!) The younger kids also found a visiting Scot a fine additional attraction, so I had to dutifully pose for some group pictures. I’m glad they were having fun: drumming, dancing, and maybe even absorbing a little history. 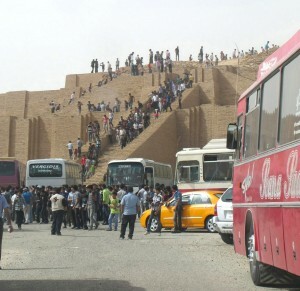 But it was also kind of a relief when the buses moved on and we really did have the site to ourselves! Ur is very ancient, but the ziggurat, is from only (!) 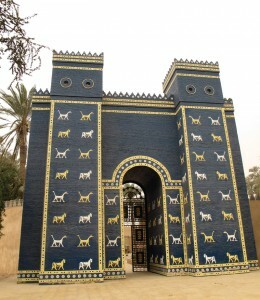 around 2100 bc. Unfortunately it has suffered aggressive modern restoration. 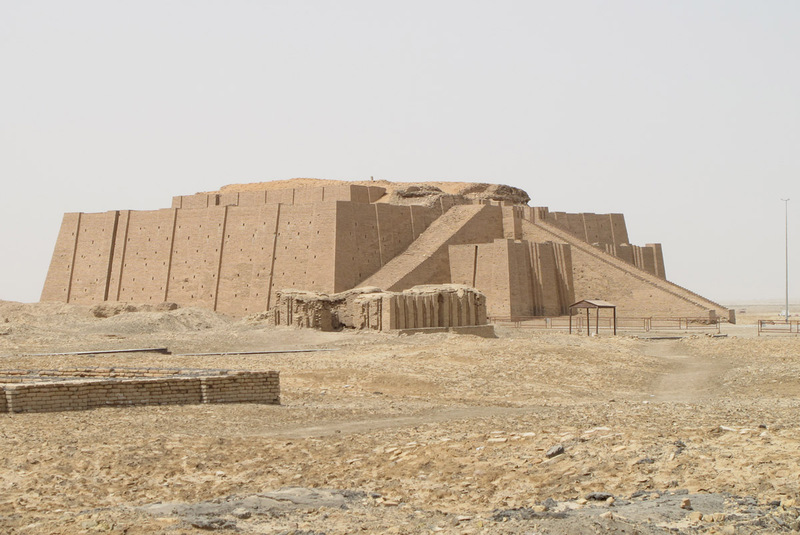 The ziggurat core is original, but almost all the outer facing and stairs are an imaginative reconstruction. 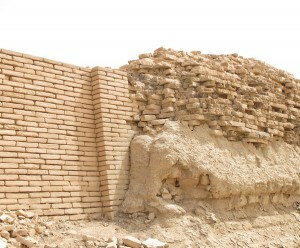 Near the top, some of the ancient brickwork is visible. Both old and new brickwork was built with included layers of asphalt for water-proofing and flexibility. 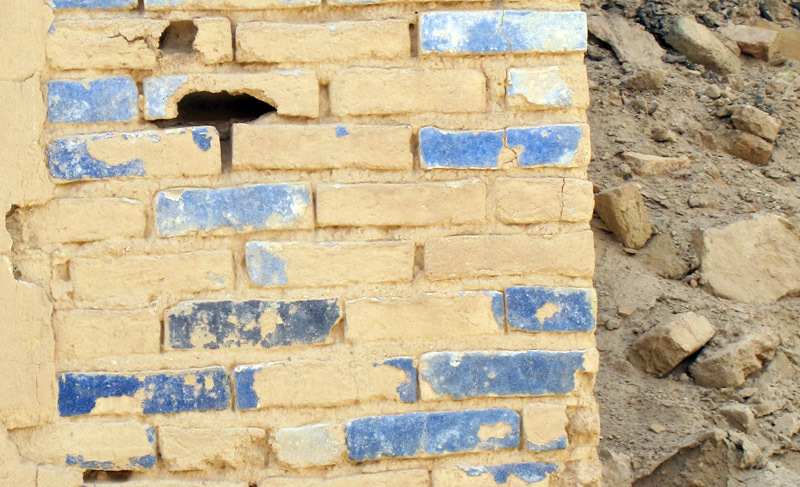 At a few places near the top it’s possible to see the pristine new “restored” walls melding into battered original sections. 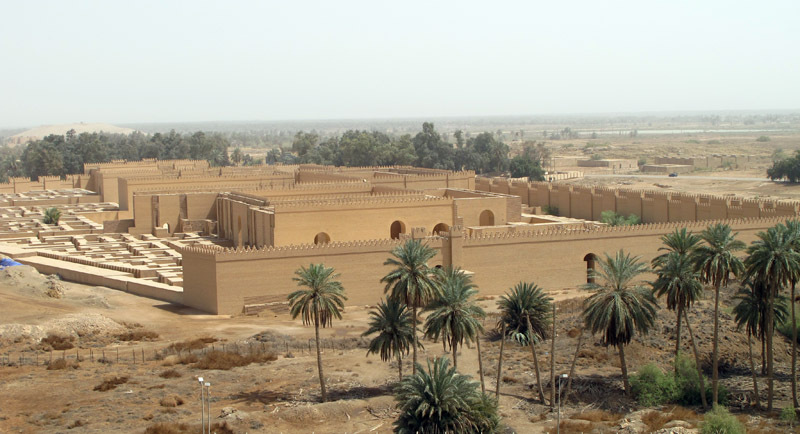 There are a number of other excavated buildings, including the Royal Cemeteries of Ur and a large (reconstructed) residential building, rather optimistically identified as “Abraham’s House”. And here are some overall tour notes.